MONTREAL -- Canada's counter-proposals on controversial American demands for a renewed NAFTA were not rejected out of hand Thursday by the United States -- providing a glimmer of hope that the continental trade pact may yet be saved. But even as Canadian officials were expressing muted optimism over that development, U.S. President Donald Trump muddied the waters with a mixed message about the fate of NAFTA. In Davos, Switzerland, Foreign Affairs Minister Chrystia Freeland was able to discuss Canada's counter-proposals with U.S. Trade Representative Robert Lighthizer. He kept his poker face, but at least he didn't say no, according to Canadian officials. The pair's talk at the World Economic Forum resonated inside the ice-encrusted Montreal hotel where Canadian, American and Mexican negotiators have been holed up all week in the make-or-break sixth round of negotiations to renew the North American Free Trade Agreement. 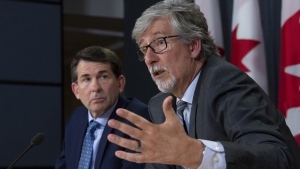 Canada's normally circumspect chief negotiator, Steve Verheul, told reporters that the tone at the table was "reasonably constructive" and the talks were unfolding "reasonably well." Freeland and Lighthizer discussed the U.S. demands for higher continental content requirements for automobiles, elimination of NAFTA's dispute resolution mechanisms, and for the addition of a five-year sunset clause, said a well-placed source. They also discussed Canada's counter-proposals. "He didn't shoot anything down. They agreed on the need to make some progress," said the source, who spoke on condition of anonymity because of the sensitivity of the negotiations. "He was engaged, he asked questions ... They had a substantive conversation, not the same degree of granularity that they have here (at negotiations in Montreal)." The source emphasized that it was too soon to assess what that means. Trump certainly didn't add any clarity in a Thursday interview from Davos with CNBC. "NAFTA's a horrible deal. We're renegotiating it. I may terminate NAFTA, I may not. We'll see what happens," Trump said. When pressed, he replied: "Will it be renegotiated? We're trying right now with Bob Lighthizer and the whole group. I think we have a good chance, but we'll see what happens." Freeland, Lighthizer and their Mexican counterpart, Ildefonso Guajardo, will close the pivotal sixth round of NAFTA talks here on Monday. But before that and through the weekend, NAFTA negotiators will be mired in talks focused on breaking new ground on some of the most contentious U.S. proposals, hoping to show enough progress to keep Trump from triggering the agreement's six-month exit clause. Canada has tabled what is being billed by government officials as a set of creative counter-proposals and the U.S. response could make or break the talks. Freeland told CNN in Davos that Canada is approaching the discussions with positive intent and sees real opportunities. "There is a set of what we call the unconventional U.S. proposals in areas like rules of origin, particularly for the car sector, like the sunset clause proposal ... there is a greater distance between the parties," Freeland said. "We have put forward some creative ideas on the sunset clause, on ISDs (investor state disputes) and creative ideas on rules of origin which we hope will help us have a real conversation on these issues." On autos, Canada is proposing that the calculation of North American content be expanded to include intellectual property and emerging technologies -- which would boost U.S. content because of American research dominance. "It's a way to start to break the logjam," Unifor president Jerry Dias said of the Canadian proposal. "I think the discussion on rules of origin is starting to head in the right direction because it's about modernizing, ways of giving credit for some of the high-tech investments." 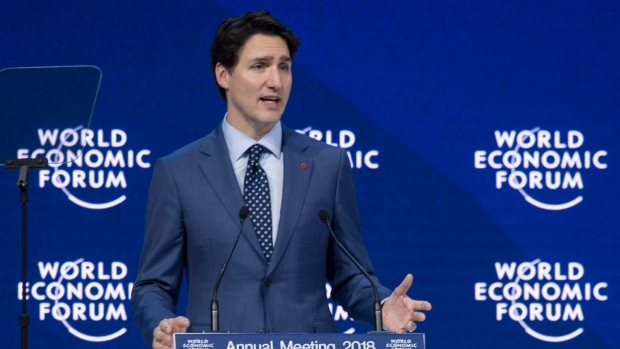 Prime Minister Justin Trudeau told reporters in Davos that a deal is "eminently possible." "I know we are going to be able to get there, and I am going to keep repeating that as often as I can," he said. But a fresh irritant awaits the negotiators on Friday. The U.S. International Trade Commission is to render its decision on the feud between U.S.-based Boeing and Canada's Bombardier, which has cast a pall over trade relations between the two countries. It will decide whether import duties of 292.21 per cent sanctioned by the U.S. Commerce Department will be applied on Bombardier's C Series aircraft. If Bombardier loses, trade experts expect the Montreal firm to turn to NAFTA -- using the pact's Chapter 19 dispute resolution mechanism -- which the Trump administration wants to scrap and which Canada is fighting to preserve.